The word moxie has become synonymous with vigor, verve, pep, courage, nerve, aggressiveness, skill, and know-how. To celebrate the concept, the new book Step into Your Moxie: Amplify Your Voice, Visibility, and Influence in the World by speaking and leadership coach Alexia Vernon presents a soul-stirring call to action for women to speak up for themselves and the ideas and issues that matter most to them. We hope you’ll enjoy this excerpt from the book. If you’re anything like me, or at least who I used to be, my hunch is that when you are on the cusp of doing (and especially fear. I really want you to stop doing that. And here’s why. What you are feeling in these moments — whether it’s stomach flu–like gastrointestinal pain, the weight of a bookcase on your shoulders, or a tornado in your larynx, it’s your body acknowledging that you are on the cusp of something important. If you mine your life to uncover the moments when you felt like you busted through your own glass ceiling — when you spoke your truth, negotiated your worth, crushed a sales call, or found the words to have a daring conversation — my hunch is you didn’t feel like you were on a beach vacation. Rather, you felt like a colony of butterflies had migrated for the winter into your thoracic cavity. This is normal. This is you on the brink of stepping into your moxie. And the last thing you want to do is to shove that sensation back down or create a narrative around it that positions you as a victim or martyr rather than as a protagonist — which is what you are. This sensation thing happens during (and before) most forms of communication when we feel like the stakes are higher than a skyscraper. When we are tasked with articulating an opinion that people might disagree with. Or when we are unapologetic about maintaining a personal or professional boundary. And if we want to consistently step into our moxie, speak up and out, and do it in a way that moves people to take action, we must learn how to get comfortable being uncomfortable. That starts with giving ourselves ample opportunities to role-play what we plan to say, so that we’re old hat at feeling our sensation and speaking through it by the memorize. Memorizing spawns more sensation. It makes you get stuck in your head. If you have perfectionist tendencies, which I suspect you do, trying to memorize what you want to say flares that perfectionism right up. When you role-play, you say what you intend to say aloud, keep your head and heart focused on your final destination, and choose moment to moment to lead your listeners there. When you role-play, you listen to the beautifully imperfect sound of your own voice and try new ways of messaging an idea or phrasing a question. You remember that you’re not a talking head, that your body language (how you move from your toes to your earlobes) impacts your audience as much as if not more than your words. So, when you role-play, you put your body into the mix so it can develop its own muscle memory and your gestures pour out of you like maple syrup when it’s go time. And when you role-play, you visualize connecting with your audience as you speak. You do all this over and over again, until you no longer find yourself in your head, searching for words. Because no matter how much sensation you experience, your body (not just your mind) has committed your message to memory, and you can speak it even if you are blindfolded, standing on one leg, and holding an entire hard-boiled egg in your mouth. Most public-speaking textbooks proselytize that speakers should rehearse for approximately one hour for every minute they plan to speak. I can stand by that — for presentations, as well as for any other high-stakes communication situations. Now, if you’ve made sensation your lackey, you may be able to get away with less role-play time. But if you’re still bowing at the altar of tummy butterflies, girl, get up on your feet and walk and talk what you plan to say some more. Because you know if you’re not role-playing, you’re spending your time ruminating, so you might as well do something that quells sensation rather than something that gives birth to a litter of worry puppies. I suspect you’ve heard a lot of this before. You may even believe it, but you’re likely not getting more comfortable — because you aren’t doing the work. Amiright? So, the sensation still feels diabolically debilitating. As a result, you’re doubling down on trying to dull it rather than playing nicely with it — by yammering on about how scared you are or how hard speaking up is. And we need to talk about why this is, chickadee, and what to do about it. The communication we do internally and out loud is habit based. And while popular psychology has suggested that it takes twenty-one days to make a new habit, most psychological research shows that it takes much longer to break an existing habit and create a new one — upward of sixty, ninety, and perhaps even two hundred plus days, depending on how deeply entrenched the old habit is. Playing nicely with the sensation that comes up around your communication and actually practicing out loud and with your body what you intend to say (instead of telling yourself “I’m scared, I’m a crap speaker, I deserve to feel like I’m sleeping in a bed of scorpions”) definitely falls in the realm of replacing an existing habit. And in order to solidify this new habit, we need new language and new practices to put the theory of playing nicely with sensation into continual practice. 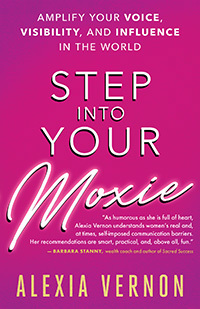 Alexia Vernon is the author of Step into Your Moxie: Amplify Your Voice, Visibility, and Influence in the World. Branded a “Moxie Maven” by President Obama’s White House Office of Public Engagement, she is a sought-after speaking and leadership coach who delivers transformational keynotes and corporate trainings for Fortune 500 companies and other professional groups and organizations, including the United Nations and TEDx. Visit her online at www.alexiavernon.com. Excerpted from the book Step into Your Moxie. Copyright © 2018 by Alexia Vernon.